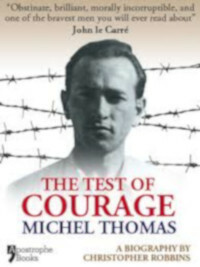 Michel Thomas survived starvation in French concentration and labour camps, and endured torture as a fighter with the French Resistance. He saw combat with the US Army and after the war hunted Nazis as an officer with the US Counter Intelligence. He captured important war criminals and was a witness in the trial of Gestapo Chief, Klaus Barbie, Butcher of Lyon. These unique and varied experiences enabled him to forge a revolutionary learning system that made him one of the world’s leading language masters. The story of Michel Thomas reads like a thriller in which adventure and heartbreak combine to produce a unique form of wisdom. To those who were taught by him, Michel Thomas seemed to be a miracle worker with a magical gift for unlocking the secret powers of the mind. This unique understanding was gained under extreme circumstances. Stateless in Vichy France at the beginning of the Second World War, he was incarcerated and starved in a concentration camp at the foot of the Pyrenees. Force into slave labour in a coal mine in Provence, he avoided being sent to Auschwitz by hiding within the confines of a deportation camp for six weeks. He escaped death to join the Secret Army of the Resistance. He was arrested and interrogated by Klaus Barbie, Butcher of Lyon, whom he deceived into releasing him, and was later re-arrested by the French Gestapo and tortured. He held out by enter a psychological state in which he no longer registered pain and after six hours of torture, his tormentors threw him into a cell and he survived to re-join the Resistance. After the Allies invaded France he joined the American forces, fought his way into Germany and was with the troops who liberated Dachau. He personally interrogated the camp’s hangman and oversaw his hand-written confession. At the end of the war he became a Nazi-hunter. Working for American Counter Intelligence he posed as a Nazi himself to infiltrate and expose underground networks of SS men dedicated o the return of a Fourth Reich. In spite of the fact that his entire family had ben murdered in Auschwitz, and many close friends killed in combat, at the very end of the war he stage an elaborate gala evening in Munich which he called a Reconciliation Concert. Using German musicians, and in defiance of strict Allied non-fraternisation laws, he brought friend and foe together in the belief that there had to be a different and better future. Author Christopher Robbins has dug deep to explore and substantiate the details of the Michel Thomas story. He has authenticated every episode through camp records, Vichy documents, Resistance papers, US Army reports and hundreds of hours of interviews with this extraordinary man. The result is one of the most inspirational stories of the twentieth century. First published by Century (Random House, UK) in 2000. Ressued in e-book by Apostrophe (UK) in 2012.